“I really love their saying: take what you need and give what you can. It really is a microcosm of what we want the world to be and it is happening in a tiny little place with children and families – and it’s great!” parent participant. Last year Eastside Family Place recorded more than 16,000 visits. With over 37 years of community service, Eastside Family Place has facilitated the healthy development of thousands of families and multiple generations. But we need support to continue our work and to be successful. From parents who volunteer simple tasks, such as sweeping the floor or loading the dishwasher, to our generous donors and sponsors, all contributions – big or small – are important and integral to Eastside Family Place. When Eastside Family Place is supported we can devote our time and energy to our work: facilitating the healthy development of young children, parents and caregivers. 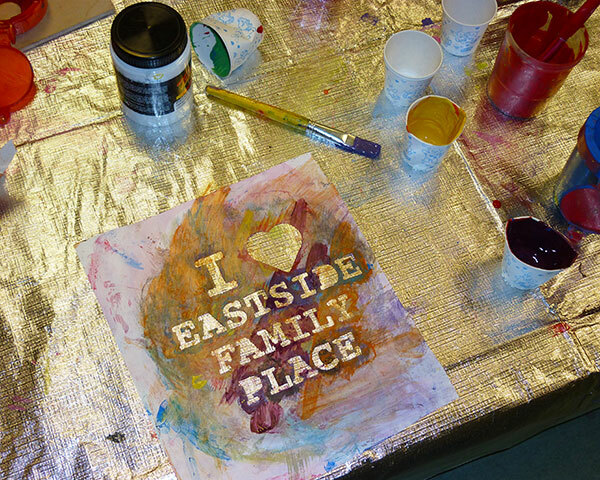 Each contribution to Eastside Family Place spreads through the community and is, in fact, an investment with unlimited growth and huge potential dividends. Please help us facilitate the healthy development of children, families, and our future. There are many ways to give to Eastside Family Place. Donations – Would you like to make an online donation to Eastside Family Place right now? Our CanadaHelps page has a number of different donor options for easy, convenient online giving. Of course, we are always happy to accept your donation in person or by cheque/mail. Please contact Anda or Mary by phone or email for further donor information. Adopt Eastside Family Place – Whether you can afford $5, $50 or $500, we encourage you to consider our monthly giving option, Adopt ESFP. Monthly giving is a wonderful way to give support all year long and to provide ESFP with regular, sustainable donations. For more information, please visit Adopt ESFP. Sponsorships are an opportunity for businesses to show their support and to invest in our community. Please see our Sponsorship page for more information. In-Kind Donations are another valuable way that local businesses can support Eastside Family Place. Donations of food and food staples are welcome for our food-security programs as well as early-learning support materials, office equipment, and professional services. Read more. Wish List – everyone has wishes. At Eastside Family Place our wish list is composed not so much of wishes, but of items that we need. Here’s a list of some of the items that are currently needed. Wish list. Fundraisers – Throughout the year ESFP engages in a number of different fundraisers. Our Children’s Clothing & More Sales are a great way for families to access low-cost clothing and items for growing children. Our big fundraiser for 2016 was the Scotiabank Charity Challenge. We hope you will also support our team for 2017 and help us make a successful fundraiser. Volunteering your time and professional skills is another great way to support the healthy development of families with young children. Here are some current volunteer opportunities. Thank you to all our donors and funders. We are so very grateful for your support! Your contributions make a difference to many young lives and families. Our Thank-you Donors and Funders is a humble, though heart-felt, recognition of our gratitude.